The heart of the cottage is the sitting room which has a beautiful open fire, laid and just ready to light in winter. The kitchen has an oven, stove, all the utensils needed, and a range of basic pantry items are supplied. In the main front bedroom is a queen bed while the second bedroom has a double bed. Both beds are made up with fresh linen and bedding and have electric blankets. Soft fluffy towels are also supplied. 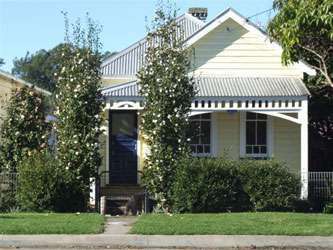 The front veranda looks out over the Berry township to the hills behind and is a lovely place to watch the world go by. At the rear of the house is a large deck overlooking farmland and a quiet rural scene. This catches the morning Berry sun and is a peaceful place to enjoy a morning tea or coffee.